Ok, I am all for honoring your ancestors, especially as we near Memorial Day here in the United States, but, am I wrong or is this just a smidge creepy? "Personal Cremation Urns are the latest in custom personalized cremation urns. They are created from one or two photographs with exceptional attention to details. With advances in facial analysis and the advent of state of the art 3D imaging, these high tech urns can be made to look like anyone. The full sized personal urn can hold all the ashes of an adult"
"The personal urn does not come with hair. For hair we can digitally add hair if you wish. For people with longer hair we can add a wig from your specifications. This cremation urn comes on an elegant solid marble base." In looking through the site they also have some very nice and a little less disconcerting products available to help you with your cremation needs. However, when I got to the "Scattering Urn Machine" link, I just had to check it out. The problem with using something like this in my family would be that I could just picture them saying - while gathered reverently around the deployment site - "Thar she blows!!" 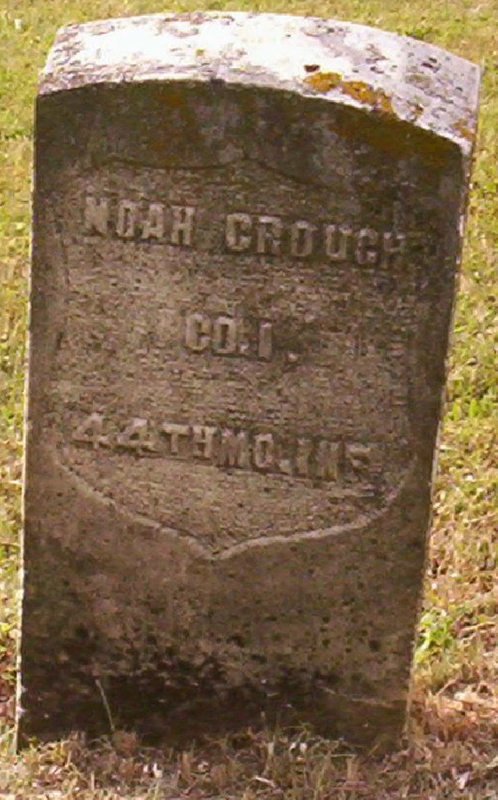 I had actually intended to write about my 3rd Grandfather - Noah Blankenship Crouch - a couple of weeks ago as part of the kickoff to the 150th Anniversary of the start of the Civil War, but didn't get a chance to, so now I am participating in the Military Monday blogging prompt. His pension file is special to me because it was the first one that I ever ordered several years back from the National Archives and was amazed at the amount of information that it contained. I am now looking forward to seeing the actual documents when I have the pleasure of attending the National Institute on Genealogical Research this July and will make my first trip to the National Archives. To start with, I had no idea that he had served in the Civil War. He and wife were one of the "brick walls" that our family had encountered in researching the family tree. It wasn't until I finally found his wife and children in the 1880 census with a new husband and stepfather, that I began to wonder what happened to him. I then realized that based on the time period and the fact that he had been in Missouri, it was possible that he had been involved in the Civil War. 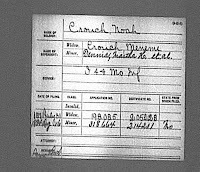 Finding his entry in the index on Ancestry.com, and with his wife's fairly unique name I was able to see that he served in Company I, 44th Infantry Regiment of the Missouri Volunteers. With this information I was able to order his military pension file and find out many more details about him and his family. 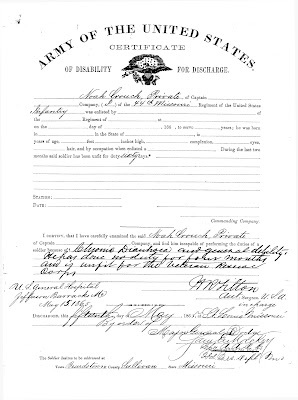 He joined the military effort in September of 1864 and fairly quickly developed gastrointestinal issues that lead to his disability discharge in May of 1865. 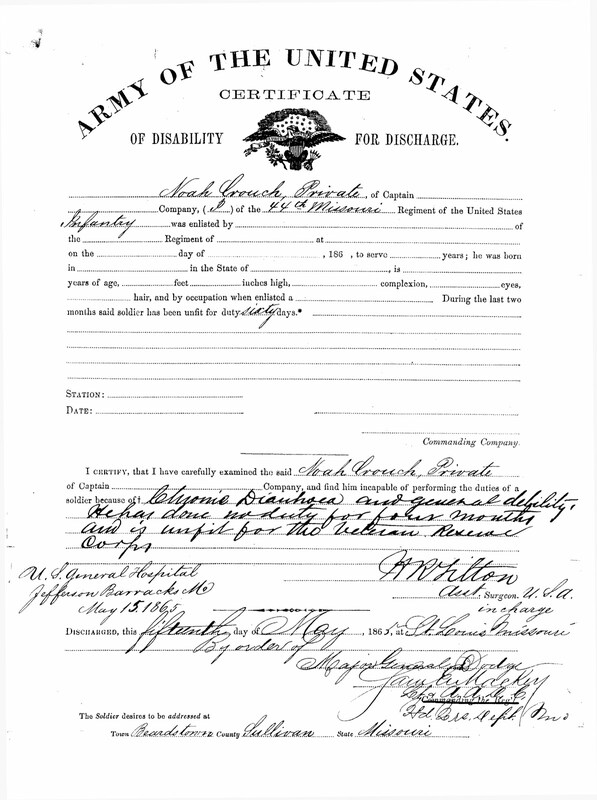 The pension file papers then provided more details about these health issues that plagued him until his death in 1870. These details then lead me to find a picture of his headstone on findagrave.com where he is buried in Deeds Cemetery, Sullivan County, Missouri. He didn't serve a great deal of time during the war, but like so many individuals and families, was affected by it for the rest of his life. I often wonder how his life may have been different had he had access to some of the medicines that we take for granted today. I also am immensely grateful to the companies, societies, archives, groups or individuals that give us the tools and content that we need to discover these details about our ancestors and come to understand them as more than just names and dates. The next blog review from my favorites list is the The Chart Chick. This blog by Janet Hovorka, reflects her connection to the Generation Maps company that she started with her husband Kim. Their company is a fantastic online genealogy chart printing service and Janet is a fantastic speaker and friend to genealogy. In addition to blogging, she also serves as the Utah Genealogical Association President and teaches at a local community college. She is one busy lady! After my comments regarding sources in the last blog review, it's ironic that Janet would be next in line. Among her many wonderful and interesting presentation titles are ones that she gives where she discusses the importance and value of citing sources. She does this in a very user-friendly and straightforward way. 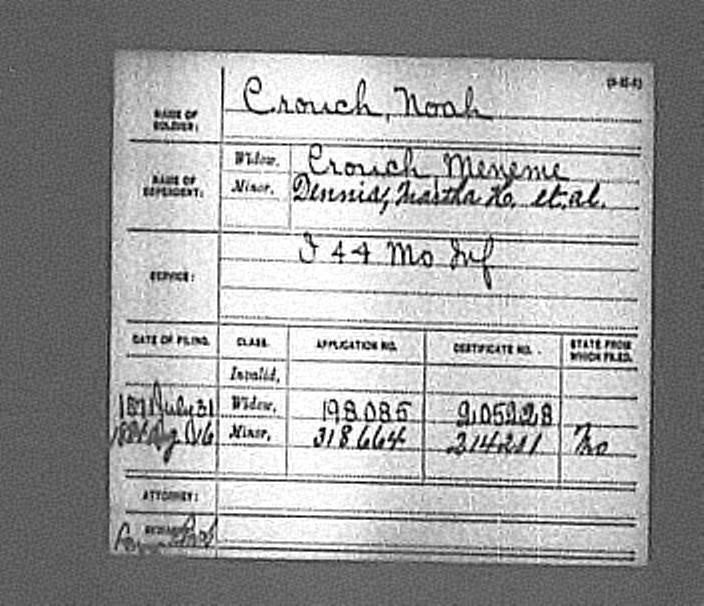 To give you an example, during one presentation at RootsTech 2011 she said, ﻿"Well documented sources establish the credibility of the researcher, and well documented sources help in analyzing the research of another person. Citing your sources doesn’t have to be a perfect science. Record enough information so that another researcher can follow your path and not have to redo your research. It is also important to record any analysis surrounding the source. Record why you think this is a good or bad source and why you came to that conclusion. It is this type of easy-to-understand explanation of the importance of source citations that most users can relate to and accept. This is the reason that it is such a pleasure to be working with Janet on the Education Committee for UGA where we are working hard to bring tools to researchers to help them improve their skills. Janet's blog shows her unique awareness as a researcher, teacher and vendor when she explores the goings-on in the genealogy world. She often gives one something to think about as you read about her take on how we do things as researchers and conference attendees. Cheers to the Chart Chick!